I liked The Mummy. But I was expecting Stargate. Some sci-fi desert thriller. I got Army Of Darkness. Don’t get me wrong, I love Army Of Darkness as much as the next cult, but I what I thought was water turned out to be Sprite. It was a little hard to swallow at first, but once I got the taste of it, I enjoyed it a lot. It wasn’t quite gin or hydrochloric acid, but… well, you get the point. Be prepared for the movie to be somewhat on the silly side. I should have gotten a hint from the whole “Brenden Frazier” thing, but I chose to overlook that. But if you want to see some more good effects and you’ve already seen the Matrix 5 times this week, I recommend The Mummy. The effects were arguable just as good as those in The Matrix. They were just on two different planes. Like Sprite and Pepsi. But The Mummy took a little too long to get going. Just when I thought to myself, “this movie’s got to get going soon,” it started to. And I’m much more patient than a lot of people. I’m also much less patient than a lot of people. There was a lot of concentration early on the conflict between the Americans and the Europeans, which nobody really cared about once the Mummy came to life. Decide for yourself. I still recommend that you guys all go see it while it’s at the movie theater. The effects just aren’t the same on a 18″ TV with mono speakers. 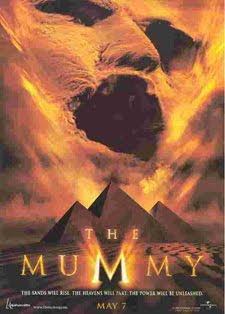 The Mummy gets 8 bugs. That’s 1/2 a bug less than The Matrix, 1/2 a bug more than Patch Adams, and the same amount of bugs as Wild Things. I’d say that’s about right. Damn government got the deer workin for em now too!